View, share and download graduation photos from Flickr. At the end of each semester, Lone Star College awards diplomas to students who complete their degree/certificate requirements. Students who attend LSC-Montgomery and who graduate during December 2018, May 2019 or August 2019 are eligible to participate in the May ceremony. 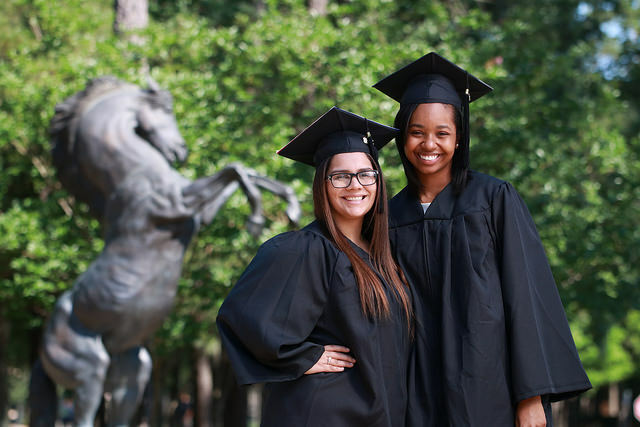 We hope you will join your fellow Maverick Graduates to celebrate this momentous occasion! Graduates must arrive by 4:30 p.m., Ceremony begins at 6 p.m.
Students must submit their graduation application by 3/7/2019 to ensure that their name is printed in the Commencement program. Students who RSVP after 3/7/2019 will not have their name and degree printed in the program due to print publication deadlines. Exceptions to this deadline will not be made. Submitted Graduation applications are reviewed by a Graduation Specialist. An email (sent to your myLoneStar email account) will be sent to students indicating receipt of the application and any missing program/certificate requirements. Questions? Contact our Graduation Department. Graduates participating in the 2019 commencement ceremony must wear a black cap and gown. Caps and gowns may be purchased from any Lone Star College bookstore via their website. Contact the LSC-Montgomery Bookstore, (936) 273-7338. Additional cap and gown ordering information can be found here. Need assistance with your cap & gown? Contact a campus Graduation Specialist or your Advisor for more information. Graduates will not be permitted to leave until the conclusion of the ceremony. Please keep talking and movement during the ceremony to a minimum so that all graduate's and their families can hear their name being called. Please leave all personal belongings (purses, bags, etc.) with your guests, as graduates will not be permitted to bring in anything other than their cap & gown. Food and drinks will not be permitted in the auditorium. Graduates will have their pictures taken by Flash Photography at the ceremony. Students and their families will have the opportunity to purchase the photographs. The photographer will contact the student directly via the information provided by the student to the graduation department. All commencement participants will receive a commemorative diploma cover during the ceremony. Diplomas will be mailed from the System Office (not individual campuses) after requirements are certified. Mailings will occur mid-June for May graduates and mid-September for summer graduates. Questions? Contact your Graduation Specialist.